I remember Dad arriving back from a very rare weekend of racing on Sulas Wing, his old wooden 25’ 5 ton Bermudan sloop. She was a lovely thing but needed a gale of wind to really get up any pace. The race was between Ardfern and Croabh. The timing for the race start must have been a bit cocked up as the fleet ran straight into the opposing tide at the Dorus Mor and sat there tacking back and forward going nowhere fast. With a bit more local knowledge, Dad stayed within throwing distance of the N shore under the tide, crawled around the point and ran away from the fleet, winning by a huge margin to the disgust of the “professional” racers. The next day, with a lot less wind and the right tide, the racy crowd left Dad standing. He came home with a cup for his win and a mounted toilet seat for being the last boat in on the return. I have always had a sneaking suspicion he was far prouder of the Seat than he was of the tiny nearly silver cup! It doesn’t suggest anything like this in any of my other guides but it had reminded me of Dad’s cheeky shore hugging manoeuvre. According to our Guestimator, we should have had 2-3 knots against us and needed to wait for two hours for slack. In the end we stuck our noses in, stayed within 25m of the reef on the eastern side and got no current at all until we were more than half way into the pass. Up the Admiralty – again! We punched about 2kts for 2-300m and then were through. No standing waves and no trouble. The outward race screamed on with white horses and big standing waves, 500m to our W……. Lesson learnt. Trust your eyes, listen to old knowledge and look for local variations at the passes. 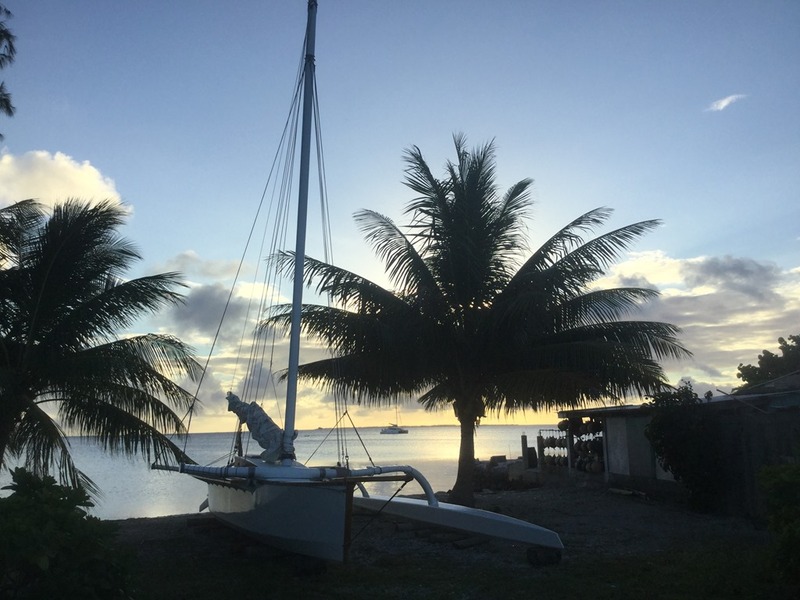 We motored five miles into the wind back E in to the deep anchorage of the village of Rotoava, the main town on this atoll. We had been told on the morning net that the community had started to put in mooring balls to protect the coral and we found two of the seven balls unoccupied. It was nice to pick one up, our first since Jamaica, and even better, they are free. 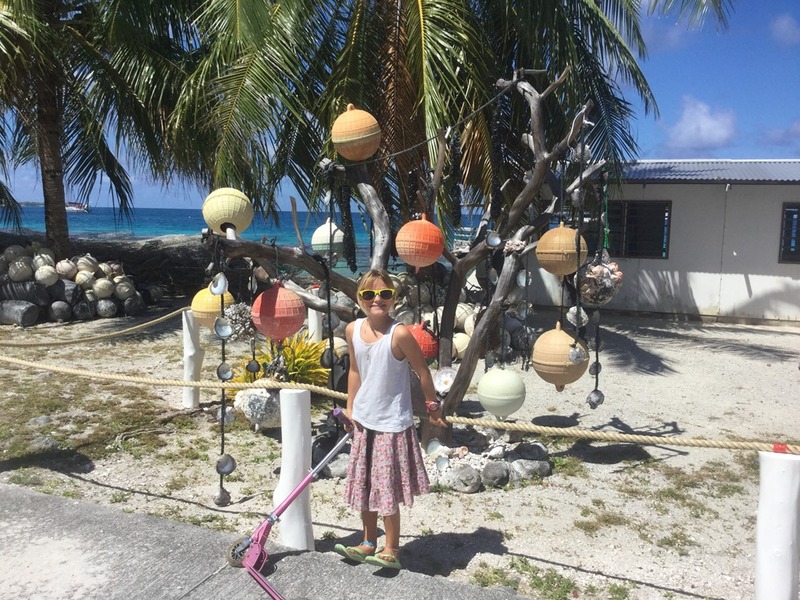 The community installed 17 balls in the atoll in Dec 15, all rated to 30 tons, and plan more once finances are raised. I think it is a great idea. 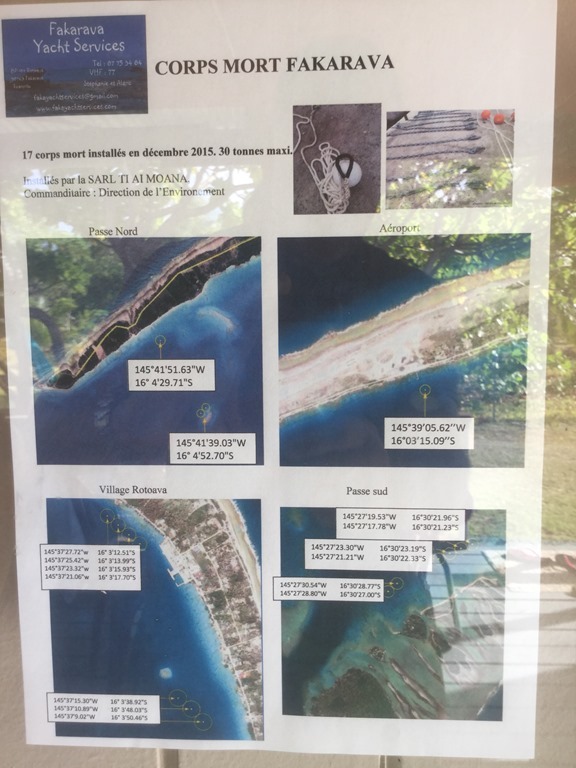 The number of yachts that parked off the village during the high season exceeded 100 this year and the locals, whose livelihood is the biosphere of their atoll, know they must protect what they have. According to the dive school that helps service them, they are not intending to charge for them. Time will tell. Their locations are below. The village of Rotoava is chalk and cheese from Kauehi. In our first week, we have had two cruise ships, the Aranui V and the small freezer container ship visit plus lots of planes. We even had a helicopter buzz us from Dragonfly, a 82m superyacht owned by two of the Google owners. The main supply ship comes in on Wednesday bi weekly. There are upmarket hotels as well as small pensions and even in the off season there are plenty of tourists around. There are three dive schools, all very well equipped, all wanting you to be NITROX qualified to allow them max dive time during the slack tide periods at the passes. There are restaurants, a pizza takeaway (someone’s house admittedly), two large stores, one which doubles as a boulangerie, pearl shops with right posh offerings, several artisan shops for the tourists and a very well appointed church. Yup, there is money here. 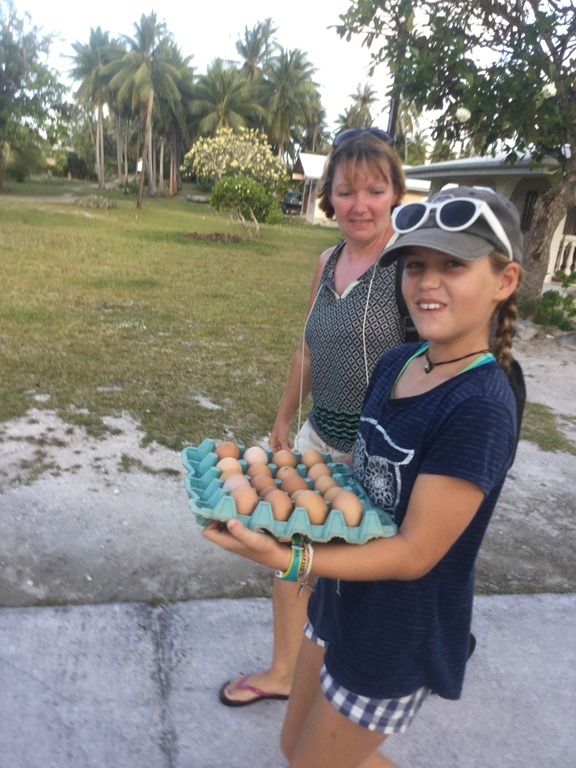 The only downside is that the local kids see too many tourists travelling through and unlike the other quieter atolls where they are wonderfully keen to welcome in boat kids, they are a lot more standoffish. We have had a couple of disappointed faces when ours have tried to mix in. I’ve got myself locally NITROX qualified and in the process, rewrote the English NITROX hand out guide for the dive school to replace the awful text they were using. I’d done two drift dives through the N pass – very good and was planning more with the school but then, good news! Soren and Taranga arrived after a bit of a bashing up from Tahiti. We hadn’t seen him since the Galapagos although Mia, part of his crew to cross the Pacific, had joined us from Taranga in the Marquesas. It was great to see him and his new crew, all divers and with a compressor on board, a plan was hatched to pair up, dive together and for us to help with the safety boat and provide him with water. I’ve done a separate blog to cover the diving. Lots of photos! 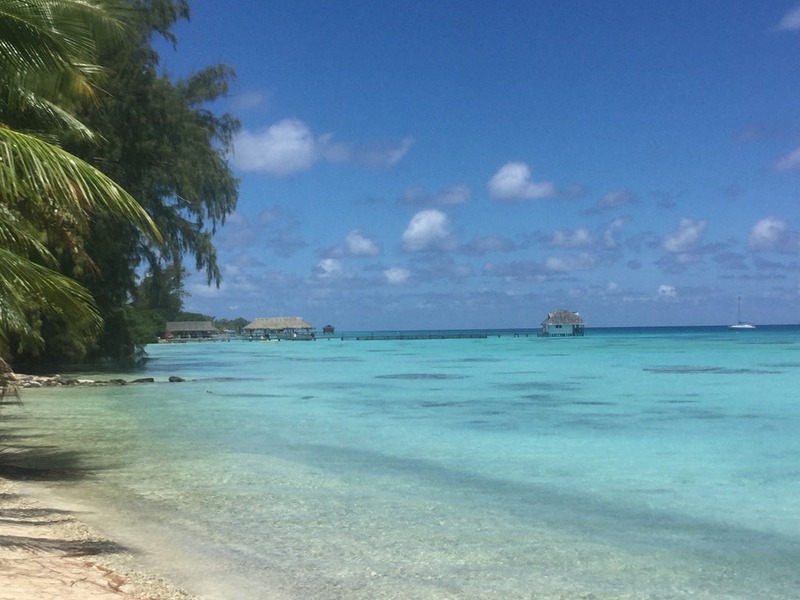 At the S end of the village, there is Fakarava Yacht Services run by Stephanie and her husband. Lou has been using their porch for internet, a good chat and a great source of information on what’s going on around the village. They can also fill gas bottles (European and US fittings) at 500XFP a kilo. Petrol and diesel can be had from them, very expensively, at 200XFP a litre which frankly is a rude mark up of 50% from the price you can order it from the weekly ferry (130xfp A L) . As a comparison, Makemo was 165 and 170XFP – wish I had bought there….. Stephanie can supply local free range eggs at 1000 a tray of 20. They are the best eggs we have had in a long while. The Taranga crowd hired bikes from them at about 1500XFP a day to explore the island. One of our favourite places to hang out has been the “pink slushy bar”, 500m S of the Catholic church, otherwise known as La Paillote. It is small, has its own jetty, generally inhabited by yachties with the very occasional tourist, has internet, offers snacks and best of all, ice cold slushies of such foulness as bubblegum and watermelon flavour. The blue bubblegum, a Hannah favourite, is guaranteed to turn your mouth a vivid blue. The cafe is also home to a very competent fisherman who appears daily with enormous Mahi that he has caught using a large spear, thrown whale hunter like from his fishing boat. 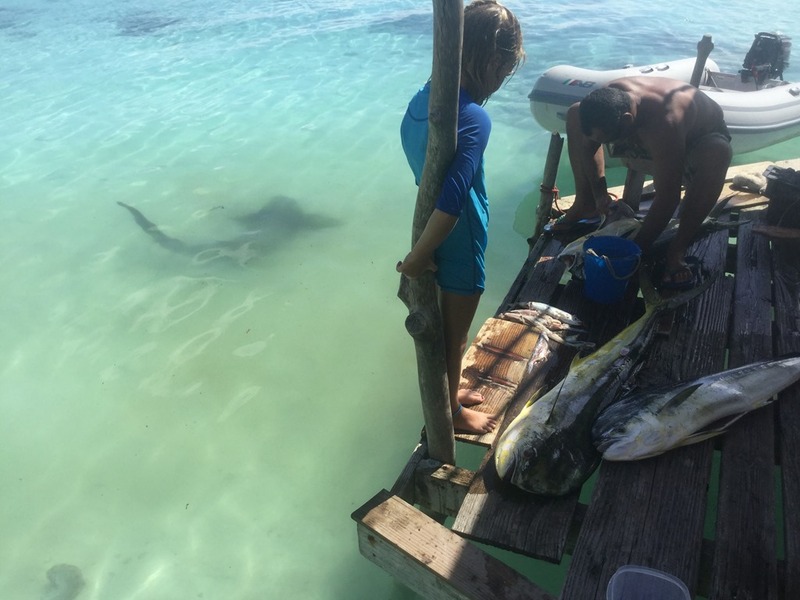 We have a great time watching the big Nurse sharks that come in to accept his offerings as he guts his catch. The small beach and coral heads off the bar are a pleasant place to enjoy life slowly going by and you get the same view as the guests in the hotel 100m down paying $1500 a week. We have been doing a lot of school and music. Eleanor is charging on with the guitar and ever more turns out noise that is an approximation of music. Hannah’s maths is coming on great guns too. The tree decorations around the village are great fun. Some use floats from the pearl industry; some use old coral strung up with fishing line. We have met another British couple for the first time in a couple of months. Mick and Kim, a lovely couple, on Phylis, started in the US and are working their way W. We have been having a bit of trouble with our lights with the main board breaker shutting down the hull lights on both sides. Kim, who has a strong electrical background from the oil and gas industry, came across to offer help with a variety of multimeters, clamps and tools but sadly we were beaten by the French board connectors. Anyone really know how Wago connectors work?? We resorted to the internet and found a Chinese “how to” video which was very good. Sadly our breakers refused to perform as shown so we still don’t have hull lights.…. After a week or so enjoying the civilisation of Rotoava, we moved S with Taranga towards the S end of the atoll. Time to explore.